"Freedom Fighters Recruiting Now - Comment if Interested!" We're two closely linked and mutually supportive fleets, with 100 members when we're at full-strength. LINE is used for communication between and within fleets, owing to the clumsiness of in-game chat, but as noted above is absolutely not a requirement. If you want to visit with fellow Trekkies, talk about the show or strategize for the game, welcome aboard! If you just want to play, no problem. Both fleet starbases are well over level 100; my side of the fleet is currently at level 108. That means every skill and proficiency for all of your characters is boosted from between six to 10 percent the moment you join. You also get increased replicator uses, decreased replicator cost, and an increase of 50 to your maximum chroniton limit. There are no spending requirements, and while we like strong event players we understand both the need to take time off and different playing styles. As an example, I don't like Galaxy events and often skip them, and I've never heard so much as a whisper about it. Other players really enjoy Galaxy events but aren't strong on the shuttles side. That's all fine - we just want active, low-drama players. If you're interested, reply here or message any FF player either in-game or in the forums. If you're interested but worried you don't quite qualify, drop us a line anyway - we like helping new players grow their games, and we're always willing to bend things a bit for active players. - Currently at Capacity - LLAP"
Removed 2 posts from this thread. Comment or Msg for more info!" Join a Top 10 Fleet & One of the Oldest and Most Reliable Fleets Around! One of the Oldest and Most Reliable Top Fleets Around! We've had a couple of players retire, so we're currently looking for new talent! 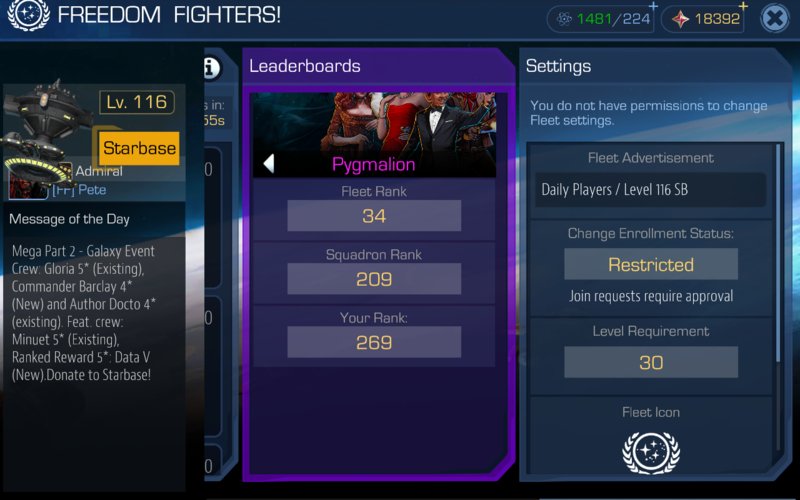 Our main Starbase is level 115 and we have openings in active, friendly squads. If interested please message here or contact me in-game at [FF] Nairne. I’m a relatively new player, been playing for about a month. I play daily and participate in events, level 30, VIP 1. "Freedom Fighters! - Have a Vacancy!" Join One of the Oldest and Most Reliable Top Fleets Around! - Are Currently at Capacity - LLAP"
If You'd Like to Join One of the Oldest and Most Reliable Top Fleets Around, Keep Us In Mind If An Opening Comes Along! 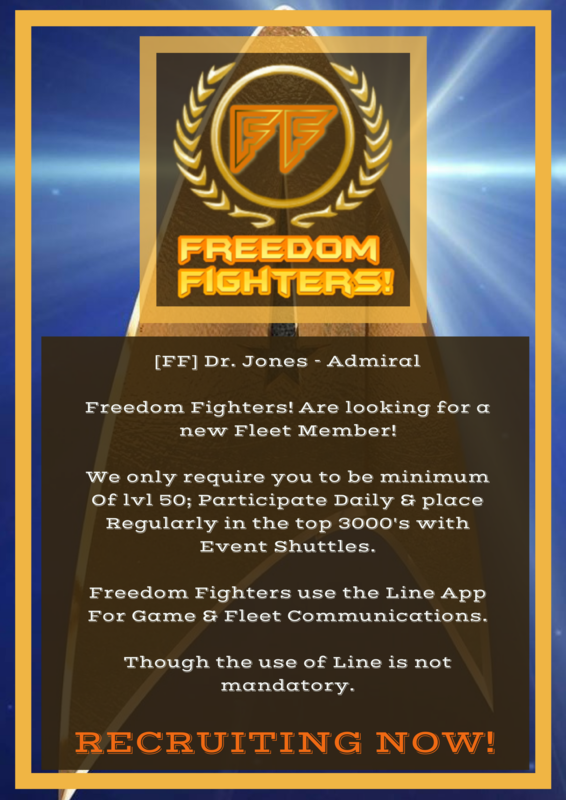 Apply to The FF's Sister Fleet Today! Come join us, we need you! & Join One of the Original, most Reliable, Stable Fleets around! One of the Original, most Reliable, Stable Fleets around! The vacancy is in the Renowned Doctors Destroyers! nb: download the Line App first. Dailies, Crew, Galaxy Map, Factions & Voyages. I am interested to join, as I just reached lvl 30. I am quite new to the game, switched from GOTA, and after my first few weeks in the game I am looking for an active fleet the has enough experience to lift my game to another level. Hi there @Henning1105 thanks for your interest, will pm you momentarily. "Freedom Fighters!" Are Currently at Capacity! through the ranks from 30/40 + ? Invitation to Join the "Freedom Fighters!" through the ranks from 40 + ?